The first FDA-cleared, at-home laser clinically proven to reduce fine lines and wrinkles around the eyes. In the past, comparable skin renewing laser treatments were only available in a doctor's office. Now, you can use this same technology at home. 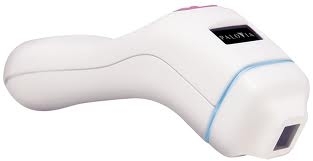 Unlike lotions and creams, which are most effective on the skin's outer layer, the PaloVia Skin Renewing Laser also works below the surface where wrinkles form. (See how the laser for eye wrinkles works.) The results are natural-looking, but dramatic. Clinical studies have shown that, with just 3 - 4 minutes a day for one month, you can reduce eye wrinkles and reverse the signs of aging. * Ongoing occasional treatments help you maintain your youthful appearance … on your own time, without costly follow-up appointments. Don't let crow's feet make you look older than you should; try the next generation of eye wrinkle treatment today. *Individual results may vary. Handpiece - The Handpiece has a simple, ergonomic design that fits easily in the palm of your hand. Charger - The Charger requires a standard 110V AC electrical outlet and allows the Handpiece to hold a charge for 3 - 4 treatment sessions. Instructions for Use Booklet - The full-color Instructions for Use booklet includes step-by-step directions with photographs. 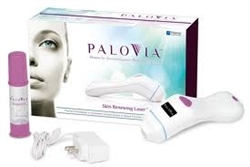 PaloVia Pre-Treatment Gel - The PaloVia Gel must be applied to skin around the eyes to ensure proper operation of the Handpiece, proper contact with the Treatment Window and optimal light penetration during treatment. Storage Case - Designed to conveniently hold the PaloVia laser and its components, the elegant storage case has ribbon hinges and a magnetized closure.